Hops are perennial twining climbers, the dwarf varieties here grow up to 2.4 m (8 ft) high each season. 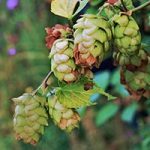 The female flowers (cones) form the familiar hops used in brewing ale; in addition, the young shoots and leaves are a good pot vegetable and numerous other uses for the plant exist. Sun or part shade; hardy to -20ºC. Pot grown.